This model of the HYS TC-617-1N listen only earphone is designed for law enforcement officers, firemen, EMTs ,Sports, Fairground and other professionals who wear their radio with a microphone on their shoulder or clipped to their shirt. If your mic has a 2.5mm jack, this earphone will click into it, providing you with the ability to securely hear broadcasts without everyone else in the area over hearing. This is great when you are in a Fairground and do not want to bother other player but even better when you are making an arrest and do not want the suspect or others to hear every broadcast. The HYS TC-617-1N listen only earpiece is the comfortable and secure way to privately listen to your radio. The Clear HYS TC-617-1N Earphone is formed from high grade surgical tubing, which is attached to a high output speaker that connects discreetly below the shirt collar. 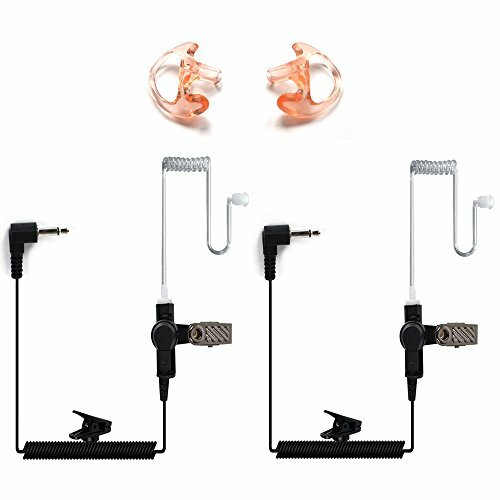 The HYS TC-617-1N comes complete with left and right medium fitted rubber ear-molds. This is designed to fit Motorola, Kenwood, Icom, Vertex, Ritron and Maxon radios and mics. WORKS WITH 2.5MM EARPIECE JACK Fits two-way radios (audio only), radio speaker mics, remote mics, and other audio accessories. Open Ear Insert Earmolds are designed for use on two-way radio acoustic tube type surveillance earpieces. EARPHONE USING ENVIRONMENTS: Excellent for use in police, military, nightclubs, bars, paintball, security, restaurants, hotels, bouncer, warehouses, and noisy environments. EARPHONE USING BRAND NAME: Works with standard, HYT, Yaesu, Alinco, Motorola and Adi transceivers and also fits radio speaker mics,and similar devices with 2.5mm connector.